Last week I went to visit my dear friend Christalene for a reiki session. I knew I was long over due as I could sense it was getting harder for me to keep up my positivity. 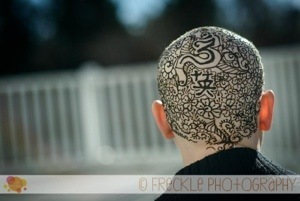 Not only was I excited for my reiki, but I was also getting a henna tattoo on my head! Yes yes I know. At first this probably sounds crazy or silly. But I must explain how we got here. About a year and a half ago Christalene and I got together so I could have reiki done. She also planned a full body painting session for me as well. You see, this was a few months after our little Cameron had passed and she wanted to help in my healing process. So while we were having my reiki session she had a vision of doing what she now calls Healing Through Body Art. 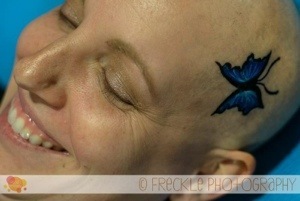 She envisioned painting women with scars or burns to empower them and let them know they are beautiful. To help them heal. 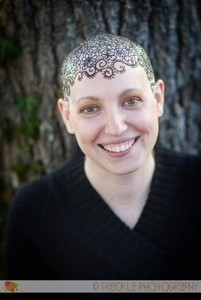 She also thought it would be beneficial for women with cancer who had lost their hair. 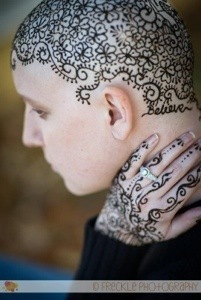 She could paint or do henna on their heads. I felt this was incredible. My body painting session was just that. It helped me on both an emotional and spiritual level to heal. Now fast forward to the present. 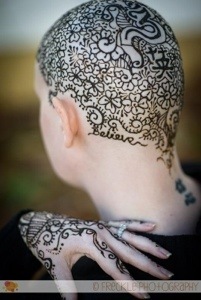 I’m getting a henna tattoo on my head! It’s like we came full circle without any indication we would be here. When this idea came to light, I was a year away from my diagnosis. Yet here we are. 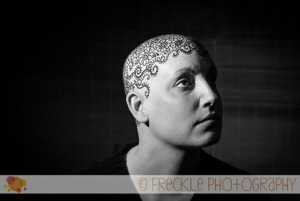 Not only did I get my henna on my head but the amazing Alison Harbaugh from Freckle Photography and Sugar Farm Productions came over to take photos and film the entire session. While Christalene was creating her art on my head I was able to reflect on my journey so far in life and how much I have overcome. It’s really incredible actually, what the human spirit is capable of. I truly hope that others can gain something from this. This entry was posted in Breast Cancer, Healing, Recovery and tagged Alison Harbaugh, annapolis, Art, Breast Cancer Healing, Christalene Karaiskakis, freckle photography, Healing through Body Art, Henna, Sugar Farm Productions by surviveber. Bookmark the permalink.